How and when did the company start? In my friends back garden (laughs). I was actually working in London at the time, because I’m a qualified fashion designer. I was working in menswear, after graduating from The Arts University in Bournemouth. But after three years of working in that environment I decided I didn’t really like London, so I moved to Bournemouth, because I preferred the lifestyle. I still did some freelance work, until a friend of mine put forward an exciting opportunity. He had some holiday lets that he needed help managing, so I took up the offer and found that I actually really enjoyed it. Before this and before fashion, I worked in hospitality. Which actually felt like a really natural progression, going from that to property. I love people. I love making them happy. Eventually the business got so busy that I had to park my fashion career. Then we decided to rent an office space and settle in somewhere of our own. The team grew larger year on year, to the point where we tripled our staff and now we have a brand new office, fit for our re-branded business. I noticed in your office you have the company ethos in a plaque on the wall, what are they again? It’s a bit of a trade secret, well not secret, but I do own the rights to them. The ethos is all about our aim to ‘bring hospitality to Lettings’. Often Letting Agents get a lot of bad press, sometimes for the right reasons and sometimes for unfair ones. It only takes one bad thing, or rather one tiny mistake and you loose the trust of your clients. We hope we can disburse that stigma and create a good name for our agents. You have another brand linked with SMR: ‘Bournemouth Beaches’. Could you tell us a little more about that? So this is actually where it all started. This is the Holiday Lets business that I initially came onboard to help my friend with. 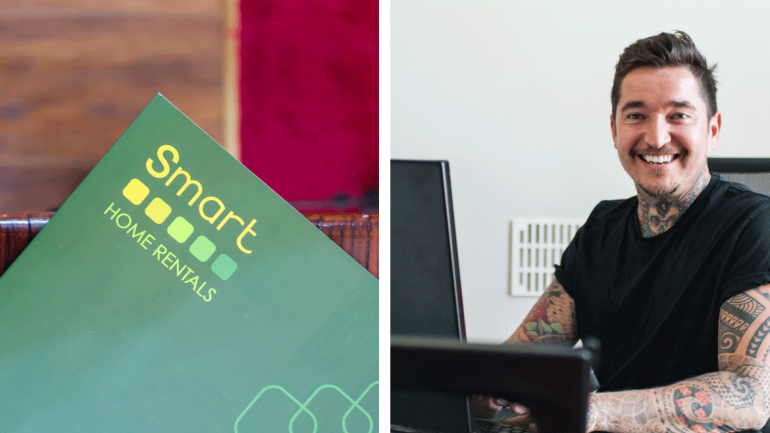 We created Smart Home Rentals so that we could appeal to a wider audience – a brand that would enable us to expand and that more people could relate to. We still retain ‘Bournemouth Beaches’ for the time being, because we have existing clients who are familiar with the name, but we hope to bring everything under one umbrella in the future. By detaching ourselves from ‘Bournemouth Beaches’ we can totally rebrand our holiday lettings agency and build the sub-brand ‘Smart Holiday Rentals’. What do you see for Smart Home Rentals in the future? We hope to go nationwide, that’s our minimum ambition. We want to grow our residential lettings business, by captivating people with our unique approach. We also have plans to build a Property Sales business. All of the domain names and pieces of the puzzle are coming together; it’s just a case of building everything up. We have given ourselves a timeframe of around 2 years, to open up 3 new branches. We hope to find our way into the up and coming areas around Dorset, like Southbourne, Swanage or Weymouth. It’s bold, but you have to take risks, if you don’t you won’t reap the rewards. How do you bring that ‘hospitality’ element into a lettings business? We like to keep things informal. We don’t wear suits and ties, because it can be intimidating. We want our customers to feel comfortable. When you think of ‘home’, do you really associate that with stuffy uniforms? No, you think of comfort, and familiarity, which is what we’re trying to convey. We don’t necessarily follow strict rules, unless you’re talking about legislation – here we have to be very strict. In terms of holiday renters, we don’t want them to feel like customers, we want them to feel like guests. That’s why so often they just call us up for a catch up, because they feel they can do that with us. My love for hospitality and being generally hospitable. I love helping people, and it can be very rewarding. When somebody thanks you for what you’ve done and you see him or her with big smiles on their faces, it makes me feel great! I have an amazing team around me. I was almost entirely absent from the business for three years whilst I took up a second degree, and it continued to run smoothly, which I think shows that I have created a strong franchise opportunity. A certain way of doing things that can be replicated nationwide. Having come from a very creative background, do you get the chance to utilise that creativity in this business? Yes actually. You don’t have to be painting or drawing to be creative. We utilise creativity in a lot of what we do: take the property write ups for example: If they are particularly captivating, it entices more people in. Our branding, our office, even the colours we choose, requires a lot of carefully considered creative thinking. I get up very early, probably earlier than I would like to. On average I probably get up around, 5am? I don’t use an alarm clock, I never have done (they generally stress me out). I’m not the biggest fan of strict rules. I do things at my own pace, but my pace matches whatever needs to be done. I love my coffee machine; it makes a triple espresso that helps me pick up the pace. I get ready, I check my emails and I plan my day. I try not to stress myself out, because I need to be clearheaded and available to my team. I’m not a lover of to-do lists, or diaries but my inbox is always empty. When something needs to be done, I get it done then and there. I arrive at the office; have a briefing with the team. Then I might call some customers at random, just to see how they’re getting on. It’s hard for me to describe a typical day because each day is different. I might go to the gym, I might eat lunch and play angry birds, who knows! I really enjoyed Sasha’s unique approach to lettings and moreover his general enthusiasm and ambition for life. Despite the casual dress wear, these guys take their work very seriously. They treat each and every customer (and journalist) like family and they will do their due diligence to ensure that you have a fruitful return from your rental property, or an enjoyable experience as a tenant, or as Sasha might say, a guest.